Elderly businessman talking and gesturing with hand. Senior business man talking during presentation and using hand gestures, chroma key background. Happy elderly man speaking and gesturing. Cheerful mature man talk at presentation, chroma key background. 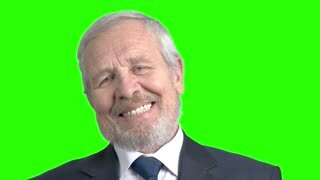 Confident elderly businessman, green screen. 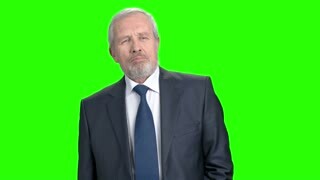 Senior caucasian business man looking displeased and nodding with head on chroma key background. 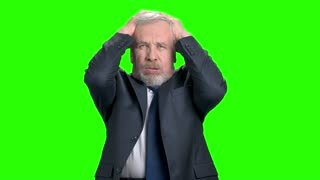 Elderly bearded businessman talking on green screen. 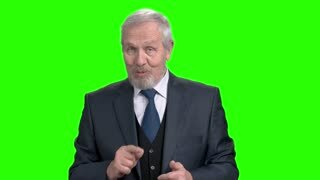 Senior cheerful man in formal wear speaking and gesturing on chroma key background. Senior businessman with tablet at conference. Elderly executive man using pc tablet during report at seminar, chroma key background. Senior businessman talking and gesturing. Elderly male executive at business conference. Presentation of new project.